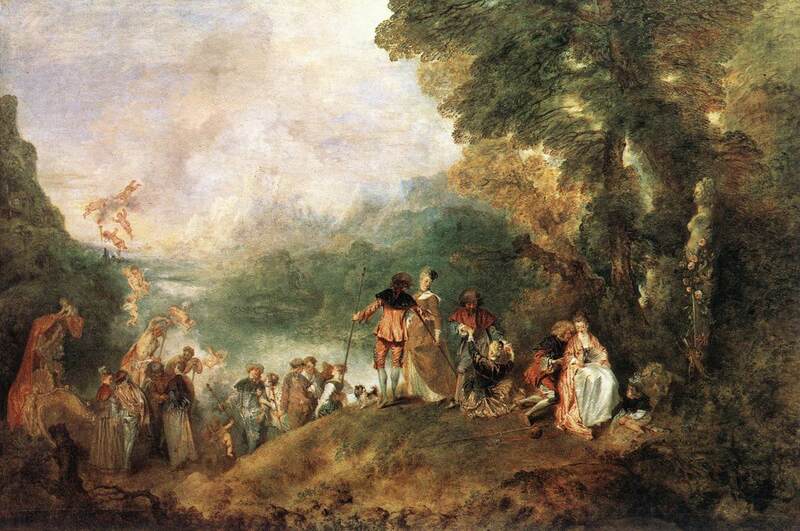 In my earliest art history classes, I remember learning that Watteau was associated with the "fête galante" genre from the Rococo period. The "fête galante" includes depictions of feasts or celebrations of gallantry, and it usually showed idle aristocrats in outdoor settings. It's interesting to see that several demeaning or derogatory terms have been associated with art initially, and then the term ends up sticking to the art/artist in a positive way. The Fauvists received their name after an art critic compared the group's paintings to "fauves" or wild beasts. Likewise, the term "impressionists" was coined by the art critic Louis Leroy as a demeaning way to mock the art of Claude Monet (and others that exhibited in the Salon des Refuses in 1874).